UpCity is a widely recognized company offering tools for inbound marketing that helps companies to unlock their potentials and increase their ROI. Every year, the company lists Top SEO firms in various domains. The team thoroughly checks the listed companies’ works competing for the honor; critically analyze them from every possible angle to list out the most deserving candidate. Being honored by UpCity shows the dedication of a company towards the industry. 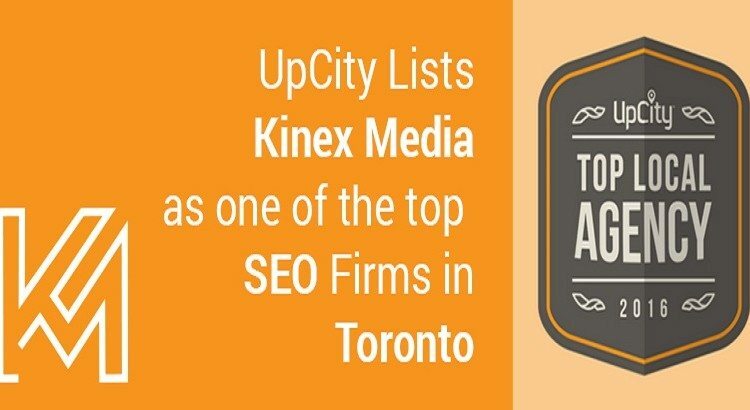 Recently, Kinex Media is listed as one of the top most SEO firms in Toronto region by them. Another good moment for us to rejoice and to celebrate the efforts we put in our work. SEO is no joke. Since Google has become strict and has introduced algorithms’ like Panda, Penguin, Hummingbird and RankBrain to tackle with back-hate SEO and other such factors, the challenges are huge. We deal with unforeseen challenges every now and then – and that’s the part of our work’s nature. However, we have a great team that has years of combined digital marketing experience and are motivated to bring success home, not only for us but for the clients’ as well. Recently, Our company won ” Top Digital Agency Award” in Canada 2016 from Clutch.co and more in past. Every award shows the excellence and tells us that we are on right track. The Kinex Media team is fully motivated and has loaded their guns to do something meaningful for the industry and lead the others through white-hat SEO. By employing SEO technique with doing content marketing to extend the project’s reach, we have done it for our clients.